"The Girl With the Fishbowl Eyes"
At last, a highly touted long-anticipated local album that lives up to its pre-release hype! Go Jimmy Go gets it all right with "The Girl With the Fishbowl Eyes" and should be a front-runner for a 2006 Hoku Award once the CD hits local record stores on Tuesday. Don't burden the sextet with being the "best this" or "top that" -- just enjoy their success in blending rock, ska and reggae in imaginative ways. Give the guys credit for stepping forward with a remake-free album too. The music is warm and inherently organic thanks to the live horns and tight rhythm section. "Set Me Free" reaffirms GJG's skill at using Jamaican rhythms without going Jawaiian. "The Governor's Daughter" is a whimsical albeit enigmatic ska fantasy. "Open the Door" and "Every Road I'm On" offer social commentary delivered with serious soul undercurrents. Fans with an eye for detail will note that the retro-style album art includes a fake "ring" where a vinyl record would leave the imprint of wear on the cardboard or paper sleeve. Many local recording artists include a religious song on their albums these days, even if they don't define themselves as "Christian artists." Most of the songs on this anthology are of that type, although without adequate liner notes most people will have no idea who some of these acts are or the history of these recordings. For instance "Pule A Ka Haku (The Lord's Prayer)" from the Makaha sons of Ni'ihau's first live album, dates from the early 1980s. "Footprints in the Sand," by Ka'u, was originally released in the 1990s. 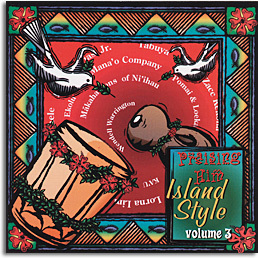 Pomai and Loeka Longakit won a Hoku Award in 1999 for another project, and Wendell Warrington was a posthumous winner of a Hoku Award and a Hawaii Music Award this year. Reign is the one of several acts representing local R&B. Lorna Lim and Tabuya add touches of Hawaiian music to this otherwise mainstream pop, soft-rock project. "Jesus You Are The Answer"
"I Will Worship His Name"
As Hawaiian and hapa-haole music reached other parts of the world, people everywhere were inspired to adopt it. This album, first released in New Zealand as "Melodies From Maoriland," dates from the 1950s and was originally released here by 49th State Hawaii Records. 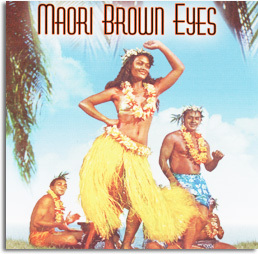 The English lyrics speak of Maoris, but the arrangements are straight Territorial Era hapa-haole music. Walker, the featured vocalist, is a delightful find. An unidentified male vocal group takes over on "Kia Ora Katoa," and other unidentified singers back her on "Lonely Little Kiwi." Unfortunately, this is one of the rare HanaOla/Cord International projects not produced by Harry B. Soria Jr., so it lacks the usual detailed liner notes. Aside from the absence of composers' credits and translations for the Maori lyrics it would be nice to know who Wolfgramm's musicians were, and what became of Wolfgramm and Walker in later years. Is Wolfgramm kin to the family that became the Jets? Oh well. "When My Wahine Does The Poi"
See the Columnists section for some past reviews. John Berger, who has covered the local entertainment scene since 1972, writes reviews of recordings produced by Hawaii artists. See the Star-Bulletin's Today section on Fridays for the latest reviews. Contact John Berger at jberger@starbulletin.com.